We arrived in Puy d’Arnac where we’ll be staying for the rest of the summer and longer. Still struggling with internet connection, we are using a GPRS mobile card, but reception is a nightmare; I can feel myself aging while waiting for downloads. I suppose it only leaves me more time to paint and sketch…and work on the house. Forgive me for not visiting and commenting much, as images and large files are impossible to open without getting thrown off internet. As it is,it took me 2 days to get this post on Africantapestry! We were promised by France telecom to have a fixed line connection by August. It remains to be seen. Life has to be accepted here as it is…nothing gets done today, for tomorrow is another day. 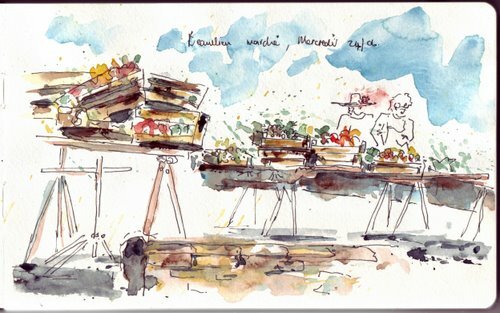 Dancing to the tune, I spent a morning at le marché in Beaulieu, waiting for Hartman who took off with the remorque to load building material. I bought fresh apricots and sweet cherries, du vin, saucisson and crusty baguette, which soon seduced me into nibbling. I sipped a coffee and took out my long-time-not-used-sketchbook. I felt quite productive. With still no sign of Hartman and his remorque, I continued with my heavy load…and baguette…and sketchbook…onto la place de l’eglise where a busload of tourists arrived shortly after, pretending to listen to the babbling guide. He, Monsieur le guide, was so bedazzled by his own performance that he continually stepped onto my toes and my half eaten baguette in his effort to be theatrical. I was sitting on the low wall, trying my best to capture the anitiquites opposite the church. We were obviously in each other’s way….I was there first though. Ah, finally, more wonderful sketches from you! I can SO relate to your internet connection! I finally got a satellite and love it. It’s true though, more time for sketching. I’ll be waiting. Lovely sketches Ronelle, and I totally relate to the GPRS thing – was stuck with that for years, we live in the country, and trying to maintain my websites and blogs was an absolute nightmare, but at last got WiMax from Telkom early this year (still no ADSL in this area) but it is heaven-sent! And connected 24/7! Thanks for having this post through, despite all the problems – if it’s any consolation, be sure it is appreciated by many of us who love your watercolour sketches. 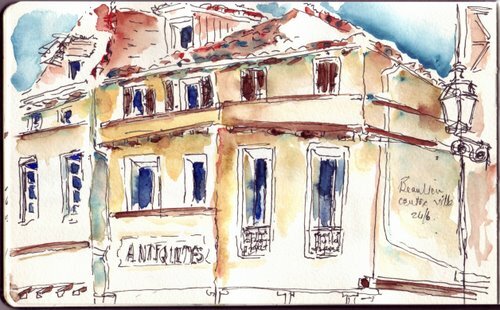 Beautiful French sketches – that sketchbook should definitely not be neglected with your unique way of capturing light and feeling – in spite of being trod on by a rude person! Keep sketching, my dear Ronell, it will be our pleasure to discover other jewels like these two!! Oh, wow–these are beautiful, Ronell! It must be frustrating to have the connection problems–when I’m on the road for work, I go nuts if I run into such problems. It’s inevitable, but frustrating, nonetheless. I feel your pain. In the meantime, i love the art you’re creating! Sigh….I wish I had yoru struggles. Sounds heavenly…well most of it anyway. Hope you get faster internet soon. be well. These make me so happy! Ronell, YOUR happiness is so infectious, helped along by these bubbly, light-filled vignettes! Have a wonderful rest of the summer! Other than the internet, it looks and sounds as though things are going swimmingly. I’m sure you’re enjoying all this wonderful sunshine we’ve been having, now that summer is really here. Lovely sketches. Have a great weekend.